Marie Howard dreams, in 1919, of being elevated from understudy to leading lady at the Tavistock Theatre. She does more than just dream! Marie schemes to replace temperamental actress Dolly Martin, oblivious to possible consequences. Before long, loved by London audiences and adored by two very different men, Marie is forced by events into a course of action that changes her life more dramatically than any role she has played on-stage. As Hitler rises to power in Germany, Marie deals with personal loss and also with the increasingly deadly enmity between her husband and his vengeful brother. Who will win the life-long battle being waged between them? And what surprises await Marie in war-torn London? If you’re a fan of romantic sagas that tug at your emotions, you need to read this book because you’ll feel deeply involved with its memorable heroine and her triumphs and tragedies from beginning to end. Backstage, the Tavistock Theatre is buzzing with gossip and intrigue. At the heart of it all is Nell’s friend, Marie Howard, who – in Nell’s view – is far too headstrong for her own good. Nell’s biggest fear is that Marie’s impulsiveness will have a catastrophic effect on her standing as an actress, but her friend is deaf to all pleas for caution. Now a fateful encounter aboard a boat to Kew is about to cause further, far-reaching, dramas. It was Sunday and Nell had suggested a picnic. Something needed to be done to cheer her friend up and the weather was wonderful. But Marie had come with the utmost reluctance. She had been reluctant to do anything or go anywhere since the coaching sessions had ended so abruptly and had flown into a rage when Nell said that it was perhaps all for the best. Well, Marie would eventually come to her senses. People did, once enough time had elapsed for them to see things in proper perspective. In Nell’s view Marie had had a lucky escape from a very dangerous situation. “He was right, wasn’t he?” Nell ventured as they stood on Westminster Bridge watching for their boat’s arrival. “Who was?” asked Marie impatiently. “You needn’t do this,” Marie told her. They weren’t wearing clothes for hurrying in. Their hats had big brims to protect their complexions and the pointed toes and narrow heels of their shoes were more suited to an elegant stroll than to trotting across bridges and boarding boats. Marie’s lilac silk dress from Selfridge’s was daringly cut in the new mode, so that not only her arms but also her ankles were exposed. As a salve for her conscience she still wore the black stockings that Mam insisted on but beneath the dress, instead of a vest and woven bloomers, she was wearing a dainty lawn chemise and matching knickers, hand-made and tucked with Valenciennes trim. Nell’s less fashionable rose-pink frock with long sleeves kept her covered up but the progress of both girls, carrying their picnic-hamper between them, was slowed by the restrictive width of their skirts as well as by their footwear and the need to hold on to their hats whenever these fell prey to the breeze from the river. They reached Westminster pier in time to board the NELL GWYN, however, and their arrival interested one passenger in particular. Otto Berger was not especially surprised by the good fortune which brought two such lovely young ladies to sit right in front of him on the upper deck aboard his boat to Richmond. Why be surprised when good fortune was his by divine right? It must be, because his wishes were almost invariably granted. Often the wish had barely been formed before it was met. His brother Ludwig said that he had the luck of the very devil. Perhaps he had. Perhaps his luck was devilish rather than divine. Its source was of little concern to him. Otto didn’t believe in questioning, or in worrying. He had better things to do with his time. Life was, after all, for living and few could dispute that he lived his with vim. He also lived without regret over the girls he had loved and left, just accepting that they came and went. Otto hoped, though, that they did not forget him quite as quickly as he forgot them. It struck him now that there was one girl he had not altogether forgotten. She was not dissimilar from the girl whose dark hair cascaded from beneath the straw hat with vibrant pink roses emboldening its brim. He found himself thinking of Lenka with slight nostalgia: but why be nostalgic when the girl he had almost married was in far off Bohemia, whereas this girl was here? There was the added fact that he had been lucky to escape marriage to a nymphomaniac. If there was one thing Otto objected to, it was sharing his woman with his whole regiment! And Lenka must also have been unstable in other ways, as evidenced by the fact that she was now hitched to Ludwig. What an extraordinary image they must present, with her beauty and his hideousness – an image that Otto would soon be seeing for himself. After seven years’ absence he was due to go home tomorrow and had been resigned to spending his last day in London alone. Now a far more attractive plan was forming. The two in front of him were talking. He decided to listen in. Otto Berger was intrigued. How very enlightening the conversation had been and yet how mystifying! He at least knew now that the redhead’s name was Nell and the beauty’s Marie and that she was in Charles’s arms each evening even though they seemed to have parted. There was a Clive who was making asides and sniggering and a Dolly who despite being out on her ear was laughing. And mention had been made of the Tavistock Theatre, which was where this little drama seemed to be happening. It was all most entertaining … and Marie’s last statement certainly needed putting to the test. If she was finished with men forever his name was not Otto Berger! A bee soon proved to be Otto’s accomplice. Perhaps attracted by the colours of their dresses, it flew toward the two girls and started buzzing purposefully. “Oh, so you’ve recognised Marie?” Nell queried innocently. “What was his wish?” Nell asked him. His persistence was far worse than the bee’s and as they left their boat Marie felt like screaming. Was there no getting rid of him? There did not seem to be – especially with Nell flirting so shamelessly. Nell was such a shy little thing normally, yet here she was, behaving like a loose woman with this horrible stranger. Whatever was she thinking of? She was certainly not thinking of Billy, whom she had sworn to love and miss for the rest of her days – and nor was she thinking of Marie, neglecting her so and paying far more attention to the foreigner than to the heartbroken friend she had insisted on bringing on this picnic. Why, Nell and Mr Berger were now carrying the hamper and neither she nor he seemed to have noticed that Marie was trailing all alone behind them. It really was too bad of Nell to prefer the Bohemian’s company to Marie’s. And how could she be so insensitive as to consort with someone who should by rights have fought in Kaiser Bill’s army? At Kew Green, where tall, gracious houses looked out on to a vivid expanse of grass and trees, Marie was sorely tempted to leave Nell to it and take a bus back to Marylebone Lane. Were she to do so, how long would it be before those two noticed? She was stopped by two considerations: firstly, she could not leave her friend unchaperoned. There was no knowing the fellow’s intentions. Marie had heard that foreigners were a law unto themselves. They had strange habits, abroad, and were certainly not to be trusted. But for them, over there, there would never have been a war. Nell’s memory must be short for her to talk animatedly and seemingly endlessly to a man who was Britain’s enemy in his heart even if he pretended not to be. Why, it was not beyond belief that Mr Berger actually knew, or was even friendly with, those responsible for Billy’s death in Flanders! Whether he knew them or not, he by virtue of his nationality was indirectly responsible. The second consideration against taking the bus home was that today was Sunday and the house in Marylebone Lane would have been taken over by Aunt Gwen’s folk. Her Pa and Ma always came over from Shepherd’s Bush on Sundays to smother Uncle John with all their complaints. Better to be here with Nell and her foreigner than there in such an atmosphere. That decided, Marie made up her mind to bid Otto Berger a speedy ‘goodbye’. The pink silk handkerchief that had saved them from the bee had been stylishly returned to the breast pocket of the mid-grey suit that he wore with darker grey spats over his shiny black shoes. What with all these and his hat, Nell had never seen a smarter gentleman. And he was speaking to her as if she were the only woman in the world! How could it be that he was more interested in her than in Marie? Nell didn’t see how and yet here he was, being charmingly attentive to her and seeming to have forgotten that she was one of a pair. She knew she was wrong to encourage his attentions when out with a friend and knew too that she would soon have to do the right thing by Marie but oh, how amazing to be the star attraction for a change instead of always walking in Marie’s shade! It had never occurred to her that she minded walking there and she didn’t mind, most of the time. But once in a while she had wondered how it would feel to change places with Marie and be Somebody instead of Nobody. Well, today she felt like a very special Somebody which was all thanks to the extraordinary man who had rescued them from that bothersome bee. He must be a very rich man indeed, because he was staying at Claridge’s where it cost a king’s ransom to stay. But he spoke of staying there as if such luxury were commonplace. And oh, the tales he told about his travels to Paris and Rome and Africa before the war! Better even than those, though, were the hints he gave about his home in Czechoslovakia. Apparently Bohemia had been a kingdom, like Britain, until the fifteenth century when – as Mr Berger put it – the crown passed to Hungary. Then, he said, it went to the Habsburgs who were Austrian Emperors. Now his country had become a province of the new republic that had been formed at the end of the war. So while he had been Austrian he was now Czechoslovakian whether he liked it or not. How very odd! His home, from the sound of things, was very big and he referred to it as a Schloss. It had a clock tower and stables and a fountain and – in his words – it unfortunately also had Ludwig living in it. When Nell asked why he lived with his hated brother he had answered that it was more a question of Ludwig living with him. Which was no answer, now that Nell came to think about it. There was a third Berger brother, she had learned, who also lived in the Schloss – whatever that was – and both those brothers had wives living there with them too, but no children. Nell’s Mr Berger did not appear to have a wife: not that he was hers except in a manner of speaking and not that it mattered to her whether he was married or not. Why should it, when she would always be faithful to Billy’s memory and when the likes of the Bergers married their own kind, however nice they were to passing strangers? They went in, through the turnstile, with Otto Berger insisting on paying all three token admission fees. Better, Marie decided, to let him pay than to slap his smiling face, which would have been her preferred option had she not been brought up to behave like a lady. Once inside the Gardens she forgot him for a while. She had surely arrived in Paradise. This was the Garden of Eden, wasn’t it, with its trees of knowledge and of life, where Adam and Eve lived until they ate the forbidden fruit and were banished? It seemed like an Eden, here within the compass of London, so exotic were its flowers, so green its backcloth. The scent was almost overwhelming and there was a music of sorts from the water-sprinklers as well as from a wide variety of birds. They were too late for the lilac of Alfred Noyes’s poem, but in time for the cuckoo which when dawn was high and all the world a blaze of sky would – though very shy – sing his song for London. In another verse the poet said that Noah had hardly known a bird of any kind that wasn’t heard at Kew and, now that she was hearing for herself, Marie believed him. Oh, to have Charles here with her and to wander hand-in-hand with love in summer’s wonderland! As things were, without him, the poem and her surroundings somehow mocked her. In company with other Sunday strollers, all dressed in their best and the ladies mostly holding parasols, they made their way along Broad Walk and came to a lake on the far side of which a pale, ornate temple rose as if from Greek myth. “Our picnic?” echoed Marie disbelievingly. Nell hoped there would be enough food to go round. Maggie, who was deaf and dumb, had prepared a picnic for two dainty young ladies. When cutting wafer-thin slices of bread and removing the crusts before making sandwiches with egg and cress she was not catering for a man’s hearty appetite. Nor could her queen cakes be described as particularly filling but knowing this – and that they were their favourites – she had given the girls six. If Nell ate next to nothing, maybe nobody would notice and maybe Otto would not feel as hungry at the end of the picnic as he had felt at the start of it. “Or I could eat more slowly,” said Otto Berger knowingly with a flash of his gold teeth. “Maggie is … ?” he asked interestedly. With the photo thrust in front of her Marie had no choice but to look. She saw a white castle set against a pine-clad hill. Its vast width accommodated countless tall windows and several doors, the main one opening on to a paved courtyard where stood a carriage and pair complete with coachman. There was a clock tower to one end rising above battlements beneath which was a long row of small circular windows rather like portholes on a boat. I read this Hook (an ebook excerpt/sample) and found it very interesting, thought it might be something for you. 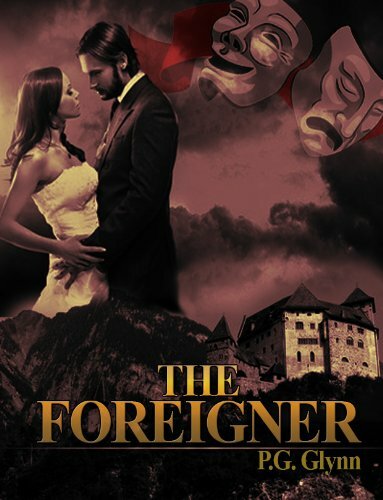 The book is called The Foreigner and the excerpt is located at http://ebookshabit.com/hooks/the-foreigner-by-pg-glynn/.